The following is a brief description of the three main types of transportation used by the British Airborne. Where ever possible; technical information has been provided. 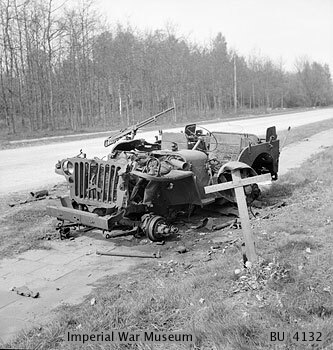 There were ostensively two types of jeep used by the British Airborne. The first was the standard transport at Section level. Below is a diagram representing the first type. Each jeep was designed in the same fashion with a few alterations and additions dependant upon their role. 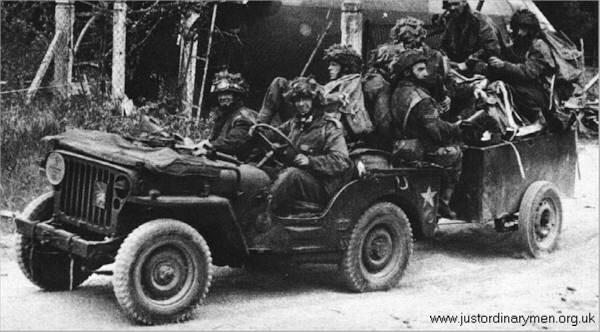 The British Airborne Jeeps were modified so they could be carried in the Horsa Glider. They were used extensively at Normandy, Arnhem and during the Rhine crossing in 1945. There were also a variety of other modifications made. The steering wheel was made detachable using a handled wing nut with the horn being moved to the left of the blackout switch on the dash board. This enabled ease of loading onto the Horsa. The front left hand section had to be cut to back to where it meets the chassis brackets. The other side was also shortened to give a more aesthetic appearance. 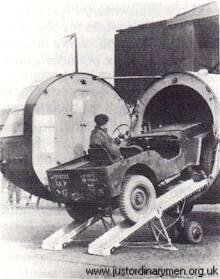 Again this modification assisted in the loading of the jeep onto the Horsa. The remaining bumper was reinforced and a towing hook added. The side handles and right foot board was removed to assist Horsa loading and manoeuvrability once inside. These too were removed for the same reason and two straps and clamp were attached to the bumper to facilitate the tools. This was moved from the rear of the jeep and a bracket fitting attached between the driver and passenger seats. A further two bracket fittings were added behind both seats. Reconnaissance Squadron jeeps had the spare wheel situated between the front bumper and the radiator grille primarily to prevent shrapnel damage to the radiator itself. This however; was not a universal modification as it sometimes led to overheating. Reconnaissance Squadron jeeps, a mounting bracket was fitted to the upper dashboard to carry the Vickers 'K' machine gun. A general modification was the addition of clips on the drivers dashboard and the right mud guard to facilitate the SMLE No 4 rifle. Radio Jeeps had additional alterations and addition's including the mounting of battery carriers on top of both mud guards, in front of the passenger seat and, to the rear, an ariel mount. There are also recorded instances of the passenger seat being removed completely to make way for a two stroke generator for charging the batteries. The number 22 wireless set was the main form of communication. 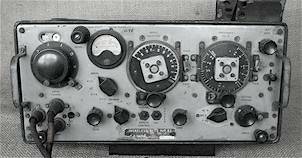 A general purpose HF transceiver operated on 2-8 Mhz it had a range of 10 miles and a maximum of 20 miles using the 12ft extension antenna. The War Department registration number (or census number) started with an 'M' and was hand painted or stencilled onto the bonnet and rear of the vehicle. The Airborne Division sign of Bellerophone riding Pegasus was also displayed on the front and rear . The tactical designation number and sign were sometimes painted on the bumpers or on detachable square plates. Over the passenger headlamp could sometimes be found a yellow bridge loading plate which carried the weight classification in tons painted in black. If the jeep towed a trailer then the number's appeared like a fraction with the upper number denoting the towing weight and lower untowed weight of the jeep. Most jeeps had the classification of 3/2. The jeep was not armour plated and it's occupants relied on it's manoeuvrability and firepower to get it out of trouble. Sadly this was not always achieved. 75% of the Reconnaissance Squadron's Jeeps were lost at Arnhem. Designed by the Special Operations Executive (S.O.E) here in England. 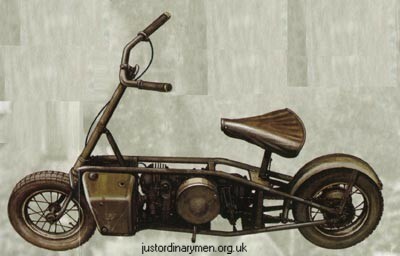 The Excelsior Airborne Welbike was named after the Excelsior Company, Birmingham who manufactured it. 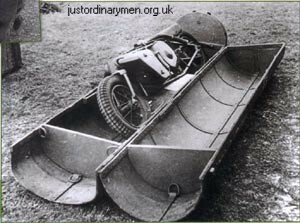 With a 98cc engine and a maximum speed of 30 mph; it was ideal for rapid deployment of airborne troops. At the time of it's introduction; the only glider available to the Airborne was the Hotspur; which was too small to transport something like a jeep. 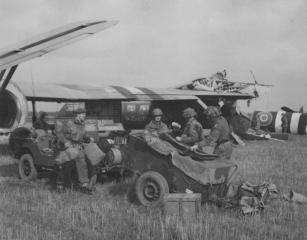 The Welbike was designed so that it could be collapsed and transported in the standard drop container which could be dropped with the paratroops. When the RAF built two more gliders, the Horsa and Hamilcar, it was soon realised that a jeep could be carried in the Horsa and a small tank in the Hamilcar and alas the Welbike's day's were now numbered. 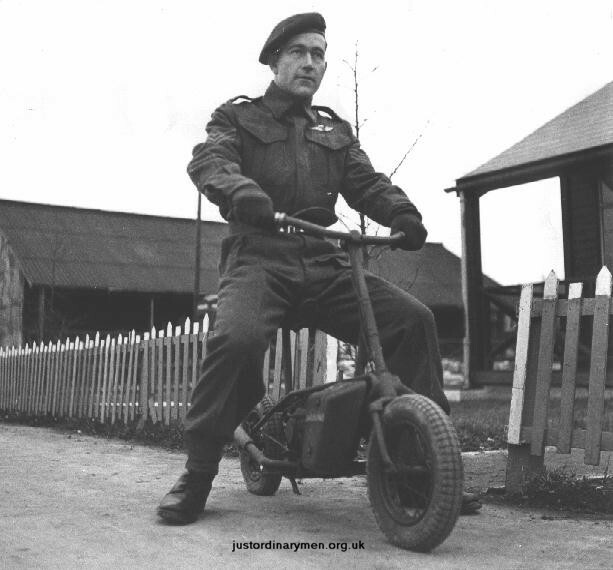 There is evidence to suggest that the Welbike saw action at Normandy, Arnhem and the Rhine Crossing; but production was stopped when it was realised that the cost of manufacture far outweighed it's operational usefulness. Manufactured by Birmingham Small Arms (BSA) Factory in 1942; it was designed to be used in battle, but not as much as originally planned. The concept, for Airborne use, was that it would drop into action with the parachutist. 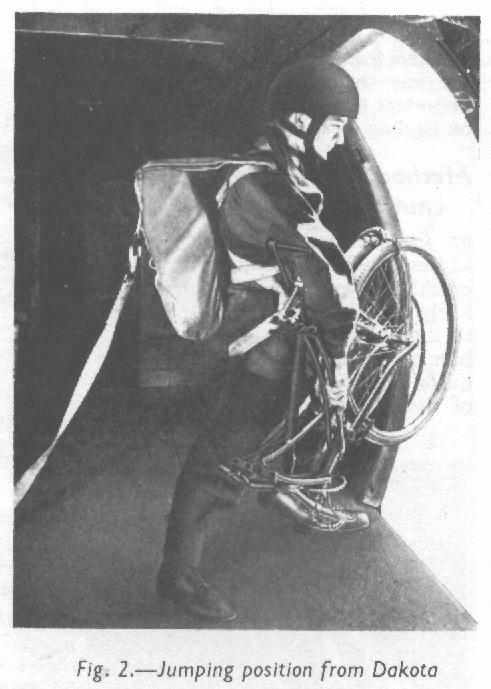 Once he had left the aircraft; the bike would be suspended beneath him via a 20 ft long cord. The design meant that the handles and seat would hit the ground first, thus protecting the wheels from damage. 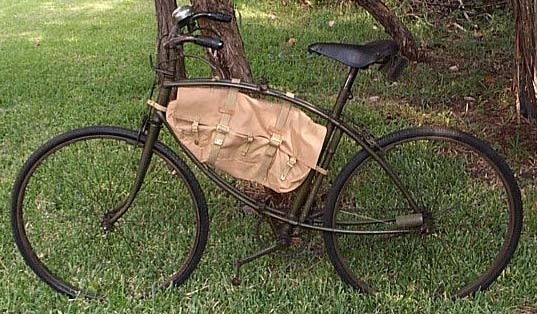 Some of these bicycles were reported to have been used during he first Airborne raid on Norway as some were found in the wreckage of gliders. Actual operational use of the BSA was limited and very few photographs, other than training pictures, are available. There are also no records readily available regarding their manufacture at Birmingham Small Arms. Ironically. 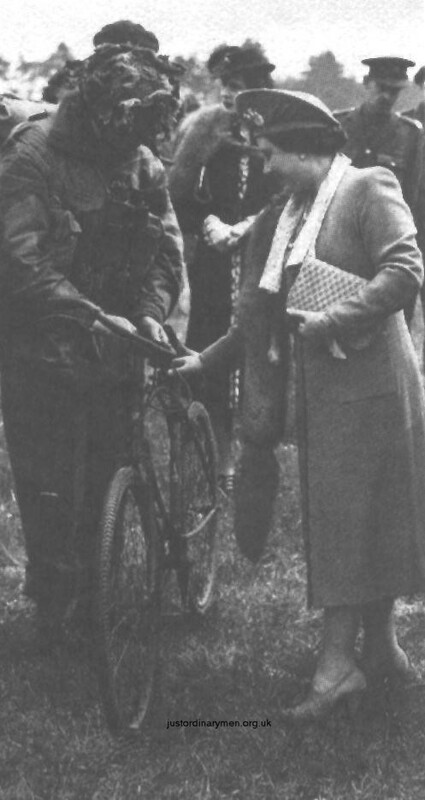 When the Airborne did use bicycles en mass during the advance to Wismar, Germany 1945, they had to use captured bicycles.